Clean water contributes to the recreation and tourism industry worldwide by accentuating beautiful beaches, white-water rivers, mountain lakes, and aquatic ecosystems such as coral reefs. Water has a powerful attraction for people. When people decide to plan vacations and travel for recreation, instruction, and pleasure, many have a strong tendency to head to the water. For example, a day at the beach provides recreation, relaxation, and a chance to renew the spirit. A third of all Americans visit coastal areas each year, making a total of 910 million trips while spending about $44 billion. Coastal tourism supports businesses like hotels, resorts, restaurants, outdoor outfitters, chartered fishing services, and travel agencies. One of the largest service industries in the United States is travel and tourism, two broad categories which involve approximately 17 million jobs. Total travel and tourism expenditures in the United States for the year 2000 reached $582.5 billion, while total revenue was $99.5 billion. In increasing numbers, domestic and foreign travelers are visiting theme parks, natural wonders, and points of interest in major U.S. cities. Worldwide, tourism annually generates over $3.5 trillion dollars, a significant percentage of which involves water-related tourism. Because of the popularity of tourism worldwide, coastal, lake, and riverfront development has dramatically increased in recent decades. For instance, riverfront developments often include convention centers, hotels, retail and entertainment facilities, housing, and sometimes an aquarium or discovery center. With the emergence of riverfront parks, land near rivers is becoming highly desirable. Almost all Americans participate in some type of water-based recreation and tourism, and (on average) spend about 10 percent of their disposable income on recreational activities, including water-related tourism. Popular waterrelated vacations may involve cruise ships, ecotourism, sport fishing, underwater diving, and canoeing and kayaking, to name a few. Cruise ships are elegant vessels featuring swimming pools, theaters, restaurants, and luxurious passenger accommodations. Some vessels built in the 1980s were twice the size of their 1970s predecessors and carried over 1,000 passengers. In the 1990s, these floating entertainment centers became even larger, some carrying nearly 5,000 passengers and crew. One half-billion-dollar ship featured amenities such as a large floating casino, a luxurious 1,350-seat theater, a 9-hole miniature golf course, an ice rink, and a shopping mall. Some cruise operators also offer small ships for up-close exploration of wilderness waterways. The shallow draft of small vessels can take tourists along shorelines, alongside icebergs and calving glaciers, and through the narrowest navigable channels. * The small vessels offer a more informal and relaxed way to observe difficult-to-reach water passages and landmasses. Beaches are a popular tourist destination. 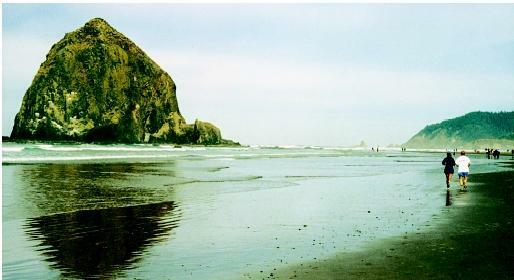 Here joggers on Oregon's Cannon Beach pass by Haystack Rock, a well-known landmark. At a height of approximately 70 meters (235 feet), it is one of the largest sea stacks on Oregon's northern coast. often threatened, natural environments, especially in order to support conservation efforts and to observe wildlife. The fastest growing segment of the world's tourism business, ecotourism is expanding at a rate of 30 percent a year worldwide. Many tourism experts believe that this increase is due to people becoming more knowledgeable about ecosystem values. Sport fishing is enjoyed in fresh water or salt water. Freshwater fishing takes place in such places as lakes, ponds, rivers, and streams. Game fish in these waters include trout, bass, and many other species. They range in size from 0.25 kilograms (0.5 pounds), such as bluegills, to as large as 45 kilograms (100 pounds), such as king salmon. Salt-water fishing occurs in oceans, estuaries , and tidal rivers. Game fish found in these waters tend to be larger than average fresh-water fish. They include snappers, bonefish, striped bass, and tuna. Fish can be landed as large as 70 kilograms (150 pounds), such as sailfish and tarpon, and even as much as 225 kilograms (500 pounds), such as marlin. Fishing expenditures are increasing, and in some areas participation rates outpace rates of population growth. A significant portion of recreational spending is tied to fish and wildlife, both of which require high quality water and habitat for survival. Cruise ships offer an array of shipboard activities (such as board and card games, casino gambling, deck sports and pool activities, theme parties, music, and entertainment) and shore excursions (such as sightseeing and adventure tours). 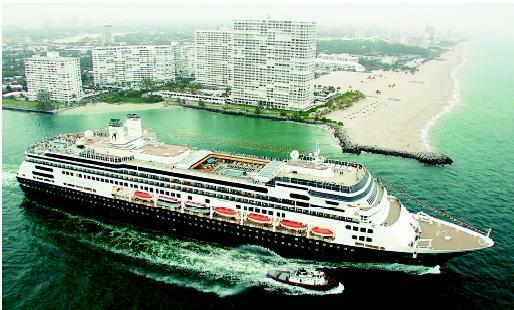 Here the ms Amsterdam departs Port Everglades in Fort Lauderdale, Florida. Scuba divers carry a tank of air that allows them to breathe while diving deep underwater. The Professional Association of Dive Instructors estimates that there are now 6 million active scuba divers worldwide. They engage in many different types of diving, of which wreck, cave, commercial, and military diving are just a few. The most common form of scuba diving is sport diving, or recreational diving, which is practiced at depths of less than 39 meters (130 feet). From these depths, divers can make a straight ascent to the surface. Diving beyond this limit requires advanced training. Whitewater rafting is popular where river flow is swift, such as the Tuolumne River below Yosemite National Park, California (shown here). Kayaking and canoeing are other popular ways to tour waterways. persons can paddle both types of boats. 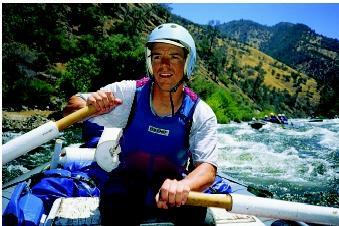 One of the sport's most exciting activities is whitewater kayaking. Participants sit in closed-topped boats and propel themselves with a double-bladed paddle through fast-moving water. Kayakers wear waterproof clothing, a life vest, and a helmet. SEE ALSO Economic Development ; Recreation ; Rivers, Major World ; Sustainable Development. Mill, Robert Christie. The Tourism System: An Introductory Text. Englewood Cliffs, NJ: Prentice Hall, 1992. American Sportfishing Association. American Sportfishing Association. <http://www.asafishing.org/index.cfm> . Eco-Tourism. Humboldt Water Resources. <http://www.humboldt1.com/~water/info_pages/eco-tourism.html> . Paddling. Canoe and Kayak Magazine. <http://canoekayak.about.com/> . PADI Today: News in the World of Diving. Professional Association of Diving Instructors <http://www.padi.com/english.asp> . Travel Statistics and Trends. tours.com . <http://www.tours.com/travelstats.php> . * See "Corals and Coral Reefs" for a photograph of a snorkeler. * See "Glaciers and Ice Sheets" for a photograph of a glacier breaking off (calving) into the sea. * See "Human Health and the Ocean" for a photograph of a scuba diver in cold water (as evidenced by the insulated dive suit).